TV show dates: January 17, 2018 — present. Performers include: Matt Ingebretson, Jake Weisman, Anne Dudek, Adam Lustick, Aparna Nancherla, Lance Reddick, Anna Akana, Jon Daly, Philip Baker Hall, Natasha Lyonne, Aimee Mann, Rory Scovel, Baron Vaughn, Kate Walsh, and Fred Willard. A dark, scripted comedy from Pat Bishop who co-created the series with stars Matt Ingebretson and Jake Weisman, the Corporate TV show explores life as a Junior-Executive-in-Training. At the profitable multi-national corporation, Hampton DeVille, Matt and Jake (Ingebretson and Weisman) are just two more cogs in the machine. Confrontational criticism is the rule of law, under the iron fist of CEO Christian DeVille (Reddick). While employees are encouraged to stay hungry, Jake and Matt’s souls are likely starving. Meanwhile, sycophantic managers like John (Lustick) and Kate (Dudek) gorge themselves on bagels and eclairs, when they’re not too busy sucking up to Mr. DeVille, or using Matt and Jake as tools to do their dirty work. Fresh out of college, Matt just wanted to help people and give back, but then life interfered. While he still bristles at the frigid coldness of life in corporate America, Jake’s ready to abuse any iota of power he gets — with gusto. One bright spot in Matt and Jake’s day is Human Resources rep Grace (Nancherla) — their sole ally. Grace, however, is nearly as ground down by their neediness and managing their catastrophes, as she by her own job. Although misery loves company, there are bright spots in their day, like finding all the parties du jour and scamming free cake. Through Corporate the audience gets an inside look at life inside soulless corporate America, as it follows two of its wretched workers. What do you think? 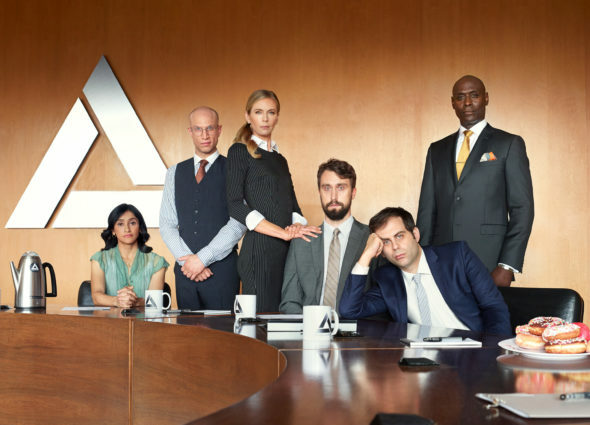 Do you like the Corporate TV series? Should this TV show be cancelled or renewed for another season on Comedy Central? I agree, please renew “Corporate”.